Home How are stem cells characterized? How are stem cells characterized? In 2007, groups from the Center of Regenerative Medicine in Barcelona (CMRB) and the Berlin Center for Regenerative Therapies at the Charité (BCRT) promoted the creation of the Human Pluripotent Stem Cell Registry (hPSCreg). "The goal was to have a repository for all of the pluripotent stem cell lines, with the idea that new ones not be generated if cell lines already existed," states Dr. Anna Veiga, Director of the CMRB's Stem Cell Bank, in remarks to Biocores. "It is the third time that the European Commission has financed this project. Now, in addition to promoting the stem cell registry, we also want to know which cell lines suited for clinical use exist in Europe, and in the rest of the world, and also include the clinical trials performed with these cell lines," she adds. The Stem Cell Bank directed by Veiga is one node of the National Stem Cell Bank of the Institute of Health Carlos III. The others are located in Granada and Valencia. “It has a specific mandate: to generate and characterize pluripotent stem cell lines. We started with embryonic stem cells (ESC), and now we focus more on Induced Pluripotent Stem Cells (iPSC)," says the researcher. The Bank receives requests from in-house scientists as well as other institutions. "Using a biopsy of skin cells or other types of samples, fibroblasts or other cell types are obtained, and iPS cells are generated from them. These are then characterized and delivered to the researcher. Depending on the needs of the client, reprogramming can be carried with integrating or non-integrating techniques. We also offer administrative support, to manage and register the cell lines and present the necessary paperwork to Ethics Committees," said Dr. Veiga in a telephone interview. Presence of the Oct4 transcription factor in a colony of undifferentiated human embryonic stem cells. Source: Stem Cell Bank of the CMRB. In Veiga's view, "It doesn't make much sense for a laboratory to generate iPS cells if they don't have sufficient know-how on deriving these cell lines." The iPS cells are generated at the CMRB Stem Cell Bank with the method required by the researcher. The stem cells are later characterized, and all of the support needed by scientists for administrative procedures is provided. When it comes to entering a new cell line in a registry like the one created at the European level, it is fundamental to have all of the information available on the stem cells generated. This type of repositories requires scientists to offer all of the data on the origin, derivation method and the various trials conducted to discover the parameters of the cell lines obtained. The characterization of stem cells is an essential requirement for the entry of a cell line into any registry. "It must be ensured that the cell line expresses a set of pluripotency markers, and is capable of differentiating both in vitro and in vivo," says Dr. Veiga. According to Lola Mulero Pérez, head of the CMRB Histology Unit, in remarks made to Biocores, when cells are reprogrammed, and/or to register new embryonic (ESC) or induced (iPSC) stem cell lines, cellular characterization must be performed. 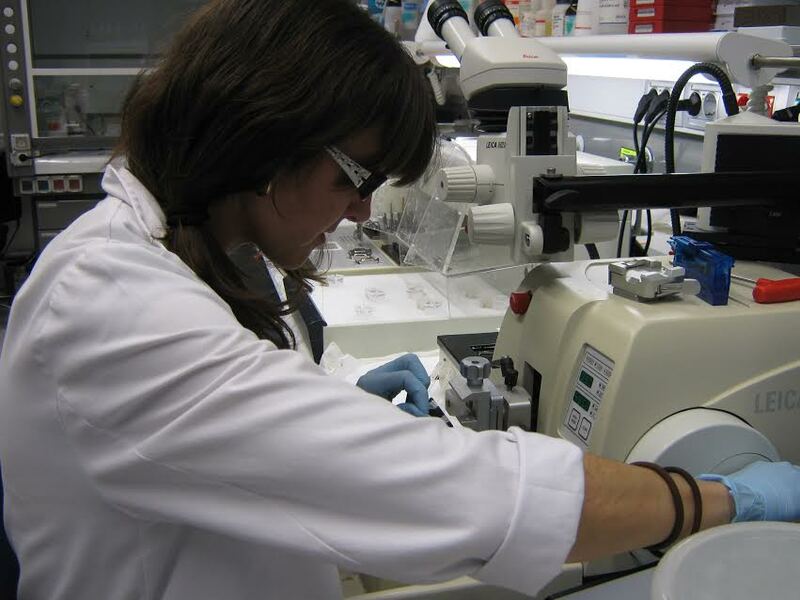 Among the trials to be performed, a study published by Dr. Mercè Martí and collaborators in Nature Protocols listed the pluripotency tests to be conducted; tests to evaluate cellular differentiation both in vitro and in vivo; analysis of the karyotype, to guarantee that these lines will maintain genetic stability; the determination of the cell identity using DNA microsatellites or HLA analysis and the performance of gene expression profiles. The Histology Unit of the Center of Regenerative Medicine in Barcelona is a core facility responsible for the characterization of stem cells and cell lines that scientists regularly use, working side by side with the Stem Cell Bank directed by Veiga. Among the routine tasks carried out by this unit, especially notable is the histological group and structural staining, such as Hematoxylin and Eosin, Masson's Trichrome or PAS-Alcian Blue; indirect immunodetection in cells and tissues; cell proliferation and apoptosis studies; fine-tuning of antibodies; conventional paraffin embedding and cryo-embedding; attainment of rotary microtome, vibratome and cryostat sections, or scientific dissemination tasks. What steps are necessary to characterize cell lines? In remarks to Biocores, Mulero explains that to confirm that the cells are truly pluripotent, the AP staining test is run on the colonies to detect the expression of endogenous alkaline phosphatase activity. “If 90% colony staining is reached, it can be confirmed that they are pluripotent, performing fluorescence immunocytochemistry and detecting the positive marking of transcription factors and membrane proteins typical of a stem cell," adds Mulero. Lola Mulero at work in the Histology Image provided by the CMRB. 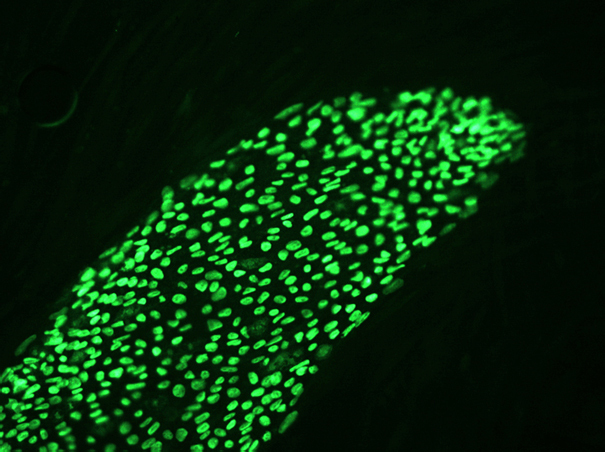 If a positive signal is obtained from all of the markers, the second part of the analysis is meant to determine whether the cells have the capacity to differentiate into the three embryonic germinal layers. “It is performed in vitro through a directed differentiation of our colonies in a culture, and in two or three weeks we obtain embryoid bodies. Depending on what is added to the differentiation medium, gland cells, neurons or even cardiomiocytes beating in a dish can be created," says Lola Mulero. “It can also be done in vivo, injecting our cells into mice (by subcutaneous, intramuscular or intratesticular administration), which generates a teratoma (tumor with diameter of one centimeter) in approximately one or two months," she adds. In either case, fluorescent immunodetection is carried out for typical endoderm, mesoderm and ectoderm markers. “If positive results are obtained in vitro as well as in vivo, it can be confirmed that it is a cell line because it has the power of pluripotency and differentiation capacity," explains Mulero. Both the CRMB Stem Cell Bank and Histology Unit provide support to scientists of the institution and external researchers. Anyone interested in generating cell lines or characterizing those now existing can contact either department through their website, by phone or e-mail. “We work to order, usually for scientists specialized in certain diseases who need iPSC from patients who have those diseases, to transfer the pathologies to the culture dishes to study them. In other words, they use the iPSC as in vitro disease models," says Veiga. The expert adds that the CRMB works as a "one-stop source" for the generation of cell lines as well as their characterization thanks to the joint support provided by the Bank and the Histology Unit.